If you have considered doing some bass angling this year and have yet to get motivated, now is the time. Despite the cool rainy weather the foothill lakes have been warming and the peak of the spring time bass bite is here. 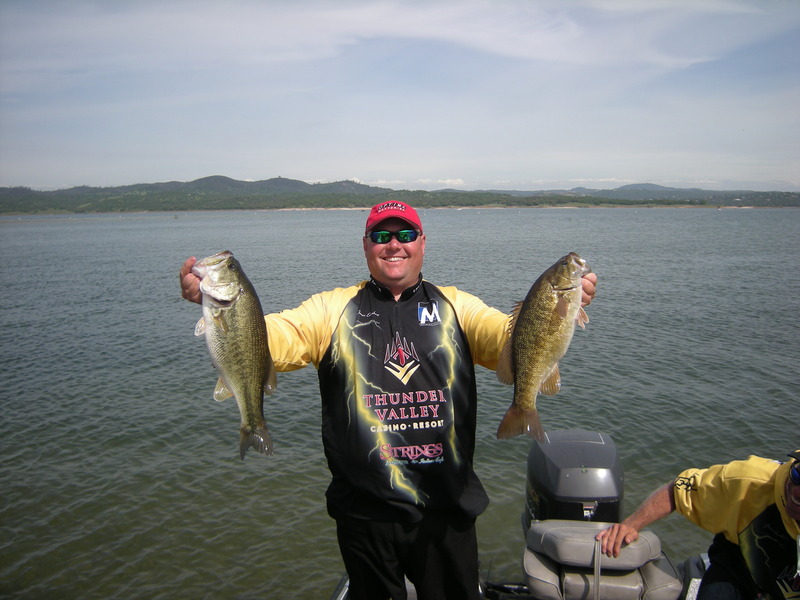 Ed Everhart fished a bass tournament on Folsom Lake last weekend and described the bite as excellent. The North Fork was 55 to 57 degrees and the South Fork was 57 to 59 degrees. Some of the shallows warmed to 60 in the afternoon. The bass were in an aggressive pre-spawn mode. Ed looked for shallow flats that are the preferred spawning terrain and fished on the flats and just outside of them. All of his fish came from the bank out to 15 foot depth. The most productive area for him was New York Creek off of the South Fork. The lake had 6- to 7-foot visibility that allowed for sight fishing on the shallow flats. One of Ed’s preferred approaches is to fish swim baits (soft plastic fish imitations) trying to target bass that are big enough to take on a 6- to 8-inch bait. These are also the fish which are big enough to put you in the money. Other baits that worked well last weekend were plastic worms in blue shad colors. Ed fished these on a drop shot rig. Texas rigged red plastic worms were also effective. Tom Moreno sent me his pond water temps from Penn Valley. His readings come from the six foot depth. Two weeks ago the temp was 50 degrees, one week ago it was 55 and this past weekend it was 60 degrees. One week ago bass were on the beds and now they have moved out. There are a lot of fry that appear to be mosquito fish in the shallows. I checked in with Johnson’s Bait & Tackle for an update on the stripers. The Feather continues to fish well. Drifting minnows is producing the best results. The water is clear enough to fish artificial lures or flies. The recommended areas continue to be well down river from Yuba City. Star Bend, Nicholas and the mouth of the Bear River have produced good results. There are more than just stripers on the Feather. Numerous anglers reported seeing salmon rolling and also catching steelhead/rainbow trout while bait fishing for stripers. The fishing is so good that some seals and a sea lion have been spotted in the Feather dining on salmon, steelhead and stripers. Up until the past weekend, the water in the Sacramento was too high to launch in most places across the valley from us. The flows decreased and stabilized which made the Sacramento a good choice. The reports mentioned good numbers of stripers from the Chico Straits all the way down to Verona. Bob Bouke said that Verona was producing mostly “shakers”. The best baits were pile worms, anchovies, and sardines. These are the typical high dirty water baits. The water conditions are improving and the minnow bite is just beginning. He mentioned some anglers were fishing at night under the full moon with large black plastic worms and catching fish. These are typically cast to the bank and retrieved. This past weekend was the first time that numbers of anglers were on the Sacramento and they did well, the fish are up in good numbers. The Tisdale launch ramp is currently being cleaned up and it is expected to be open for launching this Friday. Bob Lambertus of Penn Valley fished at Pyramid Lake, Nev. last week. He took his boat. The first day he did not go out due to high winds. The second day the lake surface was dead calm. He first tried down by the nets. The fly anglers were out in force and covering the water he wanted to fish so he moved back up toward Warrior Point. He fished over the 15 foot depth, long lining a four inch Quick Fish which dove to the 10 foot level. He and his son had a nine fish day. Bob thought he might have done better if there had been some chop on the water instead of a glassy surface. He did note that the shore anglers were also catching fish. Up in the high country a snowmobile rider reports that Jackson Meadows was still snow covered on Sunday. There was a blue hue to the edge of the lake indicating thin ice. This is often the case as the lake level rises, it floats the ice up and leaves water around the perimeter. He threw rocks that broke through the slush and splashed water. My guess is that with a little warm weather and wind, the lake might ice out in the near future. Denis Peirce writes a weekly fishing column for The Union and is host of “The KNCO Fishing & Outdoor Report,” which airs 6-7 p.m. Fridays and 5-6 a.m. Saturdays on 830-AM radio. Contact him via e-mail at dpeirce@theunion.com.